“Cross Stitch” is a new trendy and elegant name in Embroidered Fabrics. Recently Cross Stitch summer/spring collection 2011 was launched by Ayesha group of Companies . More then of 200 designsCross Stitch Designer Embroidered Fabrics collection is available in its outlets of Lahore & Islamabad to provide vast range of choices to its customer. Cross Stitch summer/spring collection clothes are available in both casual and formal wear. 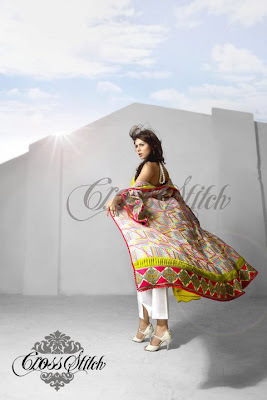 Ayyan Ali is a feature model for Cross Stitch Designer Embroidered collection. For more detail visit www.ctitchonline.com Lets take a look at latest collection of Designer Embroidered fabrics by Cross Stitch.